How Teachers And Schools Can Help When Bad Stuff Happens : NPR Ed Whether it's a hurricane, a mass shooting, racial and political violence or family trauma closer to home, teachers can be helpers. Here's our roundup of what you can do in these difficult situations. And unfortunately, the stress of children's daily lives doesn't go away with all that's happening in the world around us. 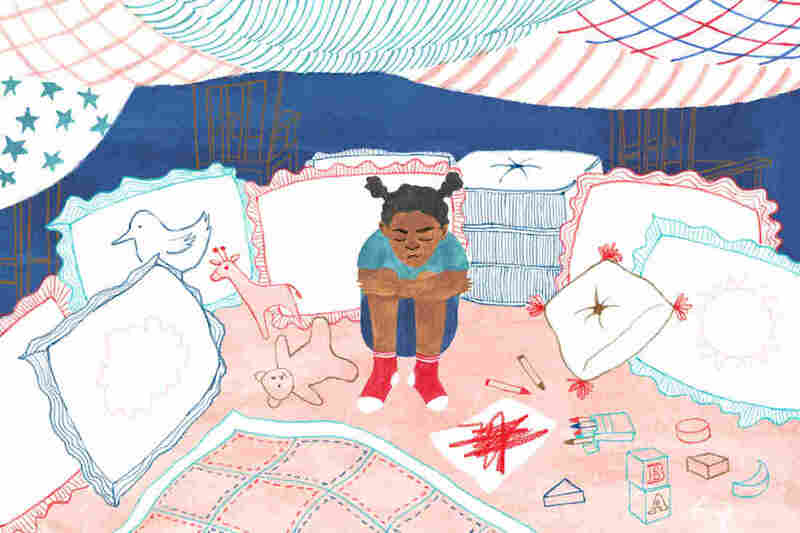 The National Survey of Children's Health consistently finds that nearly half of American children experience at least one adversity such as physical abuse or food insecurity, and 1 in 5 experience at least two. At NPR Ed we've covered many of the ways that teachers can be helpers, whether the disaster of the day is affecting your students directly or not: trauma-informed education, mindfulness, and yoga to name a few. "I would recommend that they address issues from the beginning. Talk to the students about: You know, we've all been through a difficult experience. I know that some of you may have lost your home. Some of you been in a shelter and been in very unusual circumstances. "Trauma stems from not having any control of your situation. ... Banding together, being a place where students feel safe and they know they have a voice to be heard, will go a long way towards helping them." Many students will at some point experience the loss of a loved one or family member. GrievingStudents.org is a database of fact sheets, advice and videos. Seven out of 10 teachers have a student currently in their classroom who is grieving, according to research by the New York Life Foundation and the American Federation of Teachers. "One of the problems with discussing events that just happened is that often we don't know enough about what happened. There's a distinction between current events ... and discussions about controversial political issues where kids are preparing in advance and being deliberative. In the best-case scenario, teachers are able to take advantage of current events and use them as opportunities to get kids to talk about controversial political issues. There's a big difference in talking about, 'What do you think happened?' and talking about a policy issue ... "
Roger Brooks, president and CEO of the nonprofit Facing History and Ourselves, which trains teachers to confront racism and bigotry: "There's a whole lot teachers can slow down and unpack with their students rather than get completely caught up in the emotion of the moment." Joy Osofsky of Louisiana State University says it can look like this: "More difficulty concentrating, not being able to sit still, some acting out, not being able to be cooperative in class. You also will get some children who may withdraw ..."
Belva Parrish, the counselor at Wilson Montessori in Houston, says watch for: "Excessive daydreaming ... Not getting enough sleep because they're having nightmares, so sleeping in class. You see a flat effect on the face. Or anger — acting out can often be a result of trauma." For all of it, she says, "our teachers are our front line." If teachers are a calm, steady presence, that may help their students relax, too. CARE for Teachers teaches what's called mindfulness: calming the body and mind through breathing and movement, and using insights from psychology to better regulate your emotions. When teachers were more mindful, "yelling went down," says the founder of the program, Patricia Jennings. Classrooms were rated more emotionally positive and productive. Students were more engaged. Participants reported that their anxiety, depression, feelings of burnout, being rushed and perceived stress all went down compared with a control group. Their sleep improved, and the teachers said they felt less judgmental. Here's a video with Jennings demonstrating mindfulness techniques for use in the classroom. While the young brain is impressionable to trauma, it can also be resilient, says Pamela Cantor, the founder of a nonprofit called Turnaround for Children. In a safe and orderly environment full of caring adults, Cantor explains, children can find calm. They can build relationships. If they are given a chance to make better choices when they act out, rather than being punished, they learn that they can exert self-control. Trauma-informed education seeks to address the root causes of acting out, including the emerging brain science of trauma and resilience, explains Paulette Carter, president and CEO of the Children's Bureau of New Orleans, a mental health agency for kids and families. While still enforcing accountability for behavior, Carter says, a "trauma-aware" teacher tries to help students identify their triggers and build skills for managing emotions. The teacher understands that sometimes, "that kid had a bad day and you need to give them a little bit of room to calm down." Here's more on trauma-informed education in action. Two Georgetown University pilot studies found that girls and young women [who had been through trauma and] who did yoga reported better self-esteem and developed skills that they could use in stressful situations — taking care of their own children, for example. A former student in juvenile hall spoke about the impact of yoga: "Most of us [in juvenile hall] come from traumatic childhoods," she says. "It was the only time you experienced a quiet time, when everything was so chaotic." "Always try to remember that, even if it seems like the world is all darkness, it's always gonna be a way out. Always. You may not see it, but it's there."